We’d love your help. Let us know what’s wrong with this preview of 13 Habits.com the Tale of Tortoise Buffett and Trader Hare by Lucas Remmerswaal. 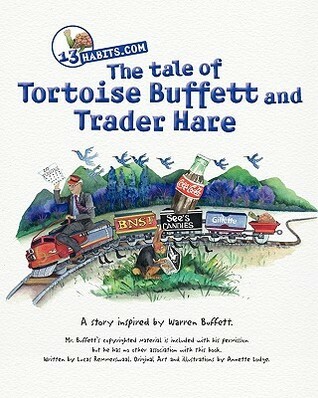 To ask other readers questions about 13 Habits.com the Tale of Tortoise Buffett and Trader Hare, please sign up. I took the book home to my 4 kids and they all loved it to bits. The two eldest are hatching business venture plans as a result and are totally enthusiastic. I have to thank 13 Habits immensely for that as I've been trying to enthuse them along these lines for some time without success. I'm took the book along to church last weekend coz Warren Buffet was actually mentioned in a sermon a few weeks back and there are MANY enthusiastic people keen to get their hands on a copy. WELL DONE Lucas Remmer I took the book home to my 4 kids and they all loved it to bits. The two eldest are hatching business venture plans as a result and are totally enthusiastic. I have to thank 13 Habits immensely for that as I've been trying to enthuse them along these lines for some time without success. I'm took the book along to church last weekend coz Warren Buffet was actually mentioned in a sermon a few weeks back and there are MANY enthusiastic people keen to get their hands on a copy. WELL DONE Lucas Remmerswaal for finding the niche and positively impacting our kids.